Home / Media / IT’S PARTY TIME ON LITTLE CLARENDON ST STREET ON SAT 20TH MAY! It’s party time on Little Clarendon Street as it hosts its second street party. Following the incredible success of last year’s event when hundreds of people turned out, the local traders have got together to organise a bigger and better event this year on Sat 20th May from noon until 6pm. Organised by liquid deli Demijohn who have a new manager in place, this initiative is to show that local retail is thriving and can offer so much more than soulless shopping centres. 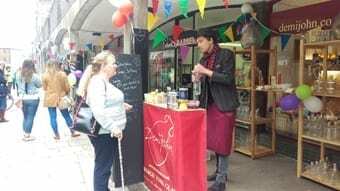 Most of the Little Clarendon Street businesses are participating (some 30 shops or businesses) and offering special one-off tastings, offers and activities. The street will be closed to normal traffic for the afternoon to allow for the entertainment. Live music will be provided by local musicians and choirs, supported by performing arts groups. Entertainment will be on offer for the younger visitors to make it a family day out, and a general carnival atmosphere will abound. From delis, bread shops, specialist retailers, cafes and restaurants, to the local charity shop (Sobell House Hospice) and hair salons, almost every trader will be putting on something special to make the street THE place to be on 20th May. Local shopping certainly offers better quality of goods and a far better feel good factor in the age of internet shopping and 24 hour supermarkets. This local retail initiative is to delight all so put the date in your diary and make sure you’re on Little Clarendon Street on 20th May. Demijohn sources unusual, delicious artisan liqueurs, spirits, oils and vinegars from around the UK and Europe and sells them in a wide range of re-useable glass bottles. Each bottle can have a free personalised message added. Gift wrapping is also available.